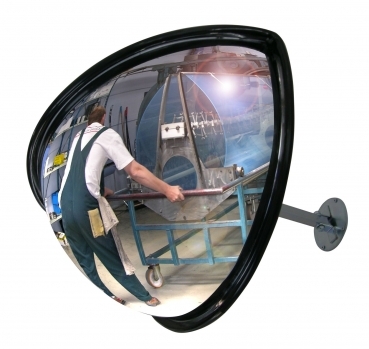 The wide-angle mirror Transpo is ideal for traffic in production facilities. The wide-angle view of the driver is enlarged and thus accidents avoided. The Transpo is also very well suited as a rear view mirror for forklifts and self-propelled construction machinery. He is surrounded by a plastic profile. Due to its light weight, the Transpo mirror can be easily attached to walls and ceilings with the supplied universal bracket and infinitely adjusted.